*Dwellings are considered as ‘unsuitable’ if the dwelling does not have enough bedrooms for the size and composition of the household. Users should be aware that the estimates associated with this variable are more affected than most by the incomplete enumeration of certain Indian reserves and Indian settlements in the Census of Population. For more information on Indigenous variables, including information on their classifications, the questions from which they are derived, data quality and their comparability with other sources of data, please refer to the Aboriginal Peoples Reference Guide, Census of Population, 2016 and the Aboriginal Peoples Technical Report, Census of Population, 2016. Indigenous identity’ includes persons who are First Nations (North American Indian), Métis or Inuit and/or those who are Registered or Treaty Indians (that is, registered under the Indian Act of Canada) and/or those who have membership in a First Nation or Indian band. Indigenous peoples of Canada are defined in the Constitution Act, 1982, section 35 (2) as including the Indian, Inuit and Métis peoples of Canada. Source: Statistics Canada – 2016 Census. Catalogue Number 98-400-X2016165. http://www12.statcan.gc.ca/census-recensement/2016/dp-pd/dt-td/Rp-eng.cfm?TABID=2&LANG=E&A=R&APATH=3&DETAIL=0&DIM=0&FL=A&FREE=0&GC=01&GL=-1&GID=1341679&GK=1&GRP=1&O=D&PID=110520&PRID=10&PTYPE=109445&S=0&SHOWALL=0&SUB=0&Temporal=2017&THEME=122&VID=0&VNAMEE=&VNAMEF=&D1=1&D2=0&D3=1&D4=0&D5=0&D6=0 -accessed December 23, 2017. 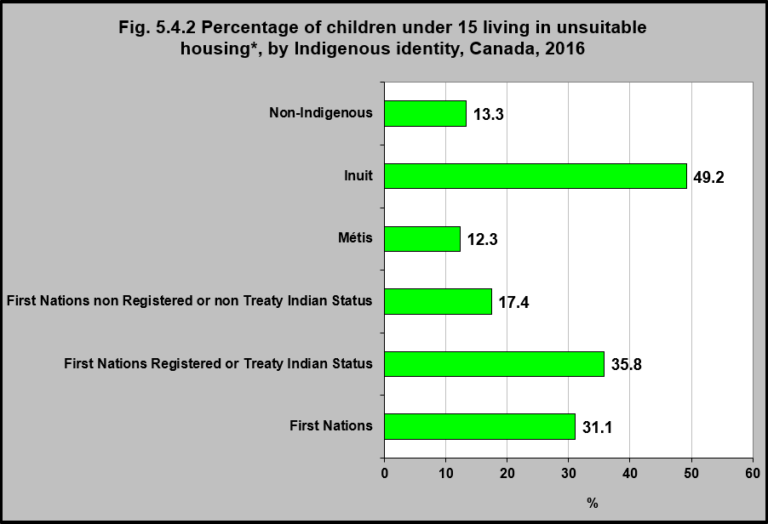 In 2016, 31.1% of First Nations children under age 15 were living in housing that was considered to be unsuitable – that is, it did not have enough bedrooms for the size and composition of the household. That was more likely to be the case among First Nations children under age 15 who had Registered or Treaty Indian Status (35.8%) than those who did not (17.4%). Forty-nine percent of Inuit children under age 15 lived in unsuitable housing, as did 12.3% of Métis children under age 15 and 13.3% of non-Indigenous children under age 15. Overcrowding is a major determinant of health for Indigenous peoples in Canada and is associated with poorer health outcomes, especially for Indigenous children.1 It has been linked to the spread of infectious diseases like tuberculosis, food insecurity, as well as poorer mental health, well-being, educational, and other child development outcomes. Overcrowding is particularly prevalent among Inuit, who are more than three times more likely than the general population to live in overcrowded conditions. 1See for example, Ruiz-Castell, M., Muckle, G., Dewailly, E., Jacobson, J.L., Jacobson, S.W.,Ayotte, P., & Riva, M. (2015). Household crowding and food insecurity among Inuit families with school-aged children in the Canadian Arctic. American Journal of Public Health, 105(3), e122-e132; Bourchard, F. (2017). Putting health into housing: Where we live matters. Nunavik Regional Board of Health and Social Services. https://www.ourcommons.ca/Content/Committee/421/HUMA/Brief/BR8828962/br-external/NunavikRegionalBoardOfHealthAndSocialServices-e.pdf -accessed September 23, 2017.